I as Chiropractors especially those of us that utilize Applied Kinesiology LOVE this quote I feel we alone are the example of what Mr. Edison was describing. Since I have some mental space to blog I am going to do a series of post starting this week talking about the things in this quote, and I'll add one more the to this illustrious quote, and it is care of the mental condition. You see as enlightened as this quote is it leaves off an essential part of humanity, which is to be mentally balanced (as much as we can be anyway). The mental habits that can cause our health to nose dive or us to never get our stuff together. So, over the next few weeks and months, I will be covering the "Triad of Health" (above) as we call it in AK (Applied Kinesiology). Looking at this triad you can see that all aspects of our health should be balanced and functioning in harmony. This is where we live as chiropractors, taking care of the physical condition of the human body. Correcting misalignments of the joint, teaching you how to move, telling you the best exercise for your health and longevity. If you are out of balance here, you can experience purely physical symptoms or as you can see structural imbalance may affect you nutritionally (Non-medical) or emotionally (non-psychiatric). This imbalance in structure could slow healing or depress your immune system, give you brain fog or any other myriad of complaints, bleeding over into other areas of your life. In natural healthcare, this is your diet. I can't tell you how many times I have seen a poor diet affect someones low back pain either by increased inflammation or irritated gut referring pain to the low back. Also, if I don't eat or imbalance my blood sugar for me my neck hurts, and it gives me a headache, and I get hangry (hungry-angry). 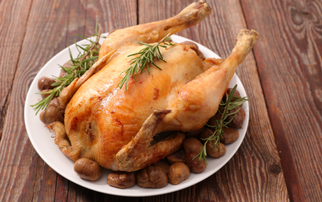 And this doesn't even start to talk about the myriad of nutritional imbalances that can cause increases in inflammation or allow dis-ease process to take hold. This one isn't as hard to conceptualize if you just stop and think about it, when you get emotionally upset (stressed) you tend to have a physical symptom. We know this is true, there is a whole class of headaches classified as stress-induced headaches. So if it is true that emotional stress may make us more susceptible to physical (structural) symptoms, it should be inherent that if we are physically unbalanced that we may be more prone to emotional upsets. 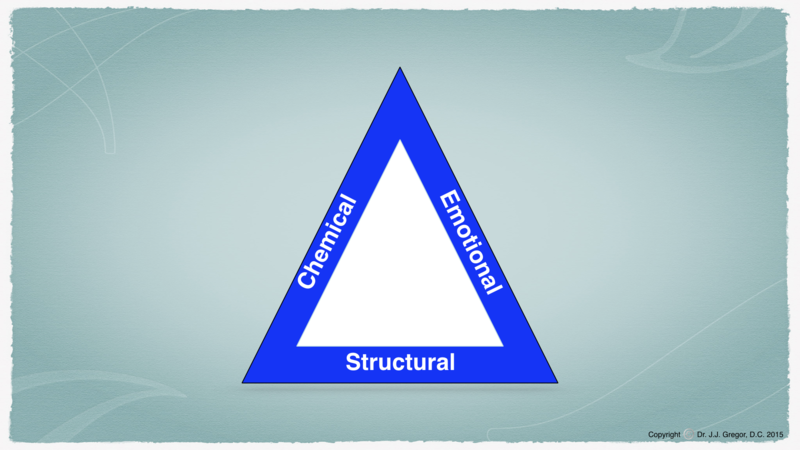 While we are here if we look at the triad below we will notice that chemistry and emotion can be interrelated also. How many of you have ever gotten "hangry" so hungry you got angry biting your family's heads off? This is the interaction between your bodies chemistry and emotions. Pay attention to the next few weeks and we will be going over all of these different aspects of human health and I promise these topics and actions steps we provide will help you along your journey to health!